Afterwards, we spoke with Leila further and began what has since become an ongoing and productive dialogue between us and AW. AW is often clumped with environmental groups like RAN and GreenPeace, as presented in the film “Cowspiracy”. So as animal rights activists, when we watched the film, we were outraged by some of featured organizations’ seeming refusal to address animal agriculture as a leading contributor to climate change. While we can’t speak for the rest of the groups, in coming to know more about AW’s work and organization, however, we have found not a denier but rather an ally. AW is de facto a human rights organization. They work to protect the rights and elevate the voices of indigenous people in the Amazon region affected by environment-destructive industries and policies. We mention this because it helps to understand why AW doesn’t aim the spotlight at the polluting industries (such as animal agriculture) themselves but rather at the indigenous victims. That being said, AW does utilize social media to call out the industries responsible for the Amazon deforestation and degradation – including animal agriculture (examples here, here and here). “Industrial agriculture, including cattle ranching, remains the biggest cause of deforestation in the Amazon,” they also say in their stunning slideshow, Explore the Amazon. We support AW’s work and their commitment to fighting for justice, and we encourage our community to do so as well. Below is the article we wrote as a result of our initial conversations with AW, illustrating the many ways animal agriculture affects the Amazon negatively, in terms of air, water and land pollution, as well as the impact it has on the lives of human and nonhuman inhabitants. In just the past 50 years, the human population worldwide has doubled, to what’s now over 7.3 billion people. Yet our demand on the planet for resources such as food, materials and energy has more than doubled. As developing countries grow stronger economies, they also grow a taste for the so-called western lifestyle that we’ve all grown up either experiencing first-hand or looking up to – a lifestyle of consumption, with fast food and disposable objects at the helm. This has allowed large corporations such as those in the oil and food industries, notably animal agriculture, to become even larger and more powerful. While we’ve all come to understand why and how the oil industry impacts areas like the Amazon as well as the global environment, animal agriculture, however, has faced very little scrutiny from the conservation community. We at Amazon Watch know that animal agriculture is one of the largest, if not the largest, contributor to overall environmental destruction, from deforestation to pollution. While our current work focuses around areas more directly impacted by oil drilling and dam projects, we acknowledge the fact that animal agriculture is just as deserving of attention and criticism, and we’ve put together a list of reasons why. Animal agriculture is by far the largest contributor to deforestation in the Amazon basin. 80% of deforested land in the Amazon basin is used for pasture. Prior to 1991, beef production in the Brazilian Amazon was chiefly used in the domestic market, but since then beef exports have been surging, at one point, growing 5-fold in a 6 year period. The international export market is now a main driver in the expansion of Brazilian cattle ranching and thus, rainforest destruction. Animal agriculture is not sustainable anywhere. Indeed, it is unnecessary and a waste of resources. It takes 2,500 gallons of water, 12 pounds of grain, 35 pounds of topsoil and the energy equivalent of one gallon of gasoline to produce one pound of feedlot beef. Plant foods require far less resources: in terms of water use, a pound of wheat takes 25 gallons of water. Animal agriculture is especially damaging in the rainforests which are home to the most biodiversity on the planet. It is obscene to use the most productive, biodiverse areas of the earth for cattle pasture and growing monocultures such as soy, of which at least 85% is used for animal feed. Brazil is both the second largest soy producer and exporter in the world almost all of which is used for animal feed. Globally, livestock uses over 30% of the Earth’s land surface and over 2/3 of all arable land. 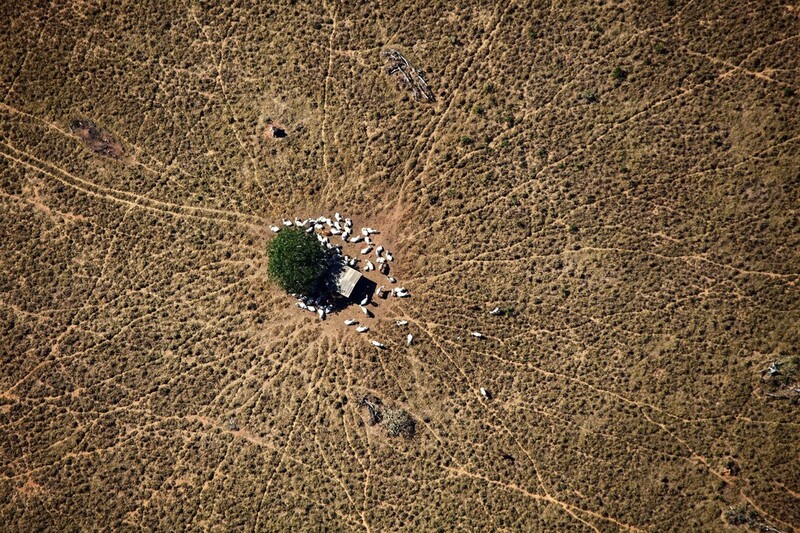 Cattle grazing in the Amazon region has devastating consequences for the terrestrial ecosystem. Soils in tropical rainforests, known as Latosoils, characteristically have a very thin but fertile layer of hummus at the top, which the forest relies on as nutrients are lost quickly due to leaching. After clearance of native vegetation, the rate of erosion these soils is up to eight times faster (McClain, Michael E., et al, eds., The Biogeochemistry of the Amazon Basin, Oxford University Press, 2001). Adding cattle to the equation increases rates of erosion as their grazing and hoofs disturb the ground covering vegetation. The removal of the rich, permeable, top layer of soil leaves behind nutrient poor, impermeable soil. These soils’ poor water retention means more erosion during the rainy season and less water retention during the dry season, leading to drought. Once the thin top layer of rich soil has been lost it is impossible for native plants to reestablish in this compacted, nutrient-poor surface (McClain). The soil swept downstream by water reaches river ecosystem and places a huge sediment burden on aquatic plant and animal life. Once in the aquatic environment sediment increases the level of total suspended solids (TSS), a crucial water quality indicator. High TSS absorbs light, and increases water temperature, which decreases dissolved oxygen. The combination of less light, less oxygen and higher temperatures makes life impossible for some native species of plants and animals. Animal wastes put additional strain on water quality, most significantly, the water pollutant nitrate. 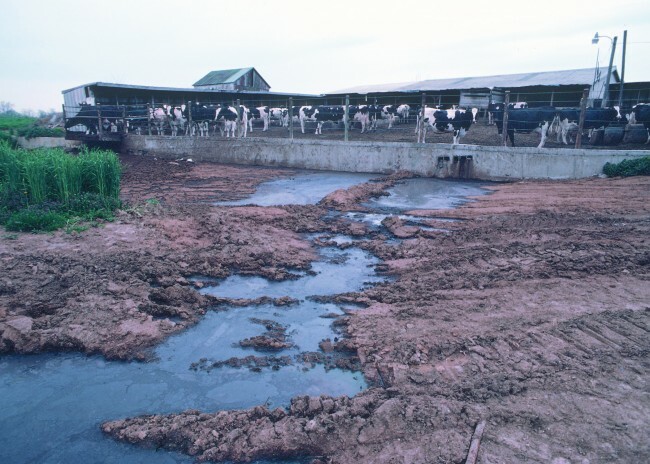 Nitrate is washed downstream from livestock pastures into aquatic environments in the same way as sediment. Once there, nitrate is toxic to most fish and other aquatic species. Animal agriculture is already a major contributor to climate change, and its impact in the rainforest will create a strong feedback cycle, completely changing the ecosystem. 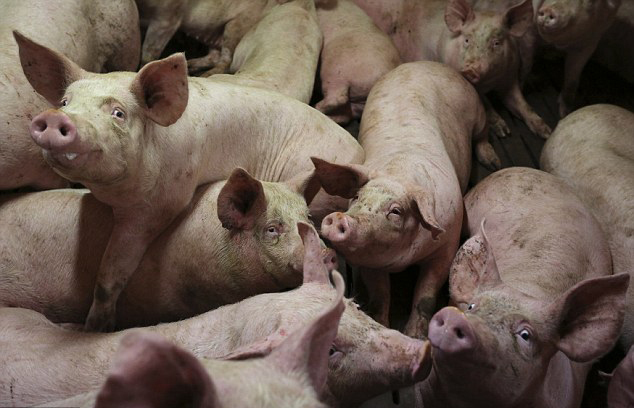 Animal agriculture contributes to between 18 – 51% of greenhouse gas emissions. The rainforest acts as a large carbon sink, taking carbon dioxide out of the atmosphere. As rainforest is cleared for animal agriculture, the carbon stored within the forest is released. An intact Amazon rainforest has huge value to mitigate the rising CO2 levels in the air. Tragically, clearing rainforest for animal agriculture is a climatic one-two punch. Globally it is some of the world’s poorest and most disadvantaged people who work in animal agriculture. These jobs are labor intensive, dangerous, and emotionally damaging. With about 2/3 of all farmed animals worldwide being raised in factory farms and killed in industrialized slaughterhouses, workers, who are oftentimes illegal immigrants face incredibly hazardous conditions including exposure to disease, unlawfully long work hours, high injury rate and even loss of limbs. Workers are typically fired after a debilitating injury and receive no health care compensation. In Brazil, there have been an increasing number of police raids on large farms and industrial slaughterhouses (usually in the Amazon) utilizing slave labor. Almost 50,000 enslaved Brazilian workers have been freed in the past couple of decades, but with slaveholders facing only minor consequences, slavery continues to be a huge problem. As Brazil is the world’s largest beef exporter, beef consumption directly supports continued slavery. Those employed or enslaved by the animal agriculture industry are far from being the only humans victimized by these monstrous corporations. Around the world, over 800 million people are undernourished due to scarcity of food, while half of the world’s grain is fed to livestock. This is an egregious misuse of resources: removing livestock from the equation would result in the ability to feed 10 billion people and eradicate world hunger. With the Academy of Nutrition and Dietetics (AND) and the United Nations, among many other renowned health outlets touting the benefits of a meat, dairy and egg free diet, and the AND stating that in fact it tends to be more healthful than the standard Western diet for all stages of life including pregnancy, and lowers the overall risk of dying due to ischemic heart disease, it becomes painstakingly clear that consumption of animals and their byproducts is completely and utterly unnecessary. It is unarguable that animal agriculture is an inherently violent, destructive industry in every one of its aspects: it exploits animals, people and the environment, from the resources it consumes to the pollution it expels. While we at Amazon Watch are working at the ground level towards preventing the industry to expand into the Amazon, there are things that you, our supporters, can do to help it from the top. You can stop contributing to animal agriculture. In the same ways as we’ve been encouraging you to seek alternative energy sources that do not demand the use of oil or water dams, we also encourage you to seek alternative food sources that do not demand the use of animals. Take a stand with us and let us work together in liberating the planet and ourselves from the oppression we’ve created.